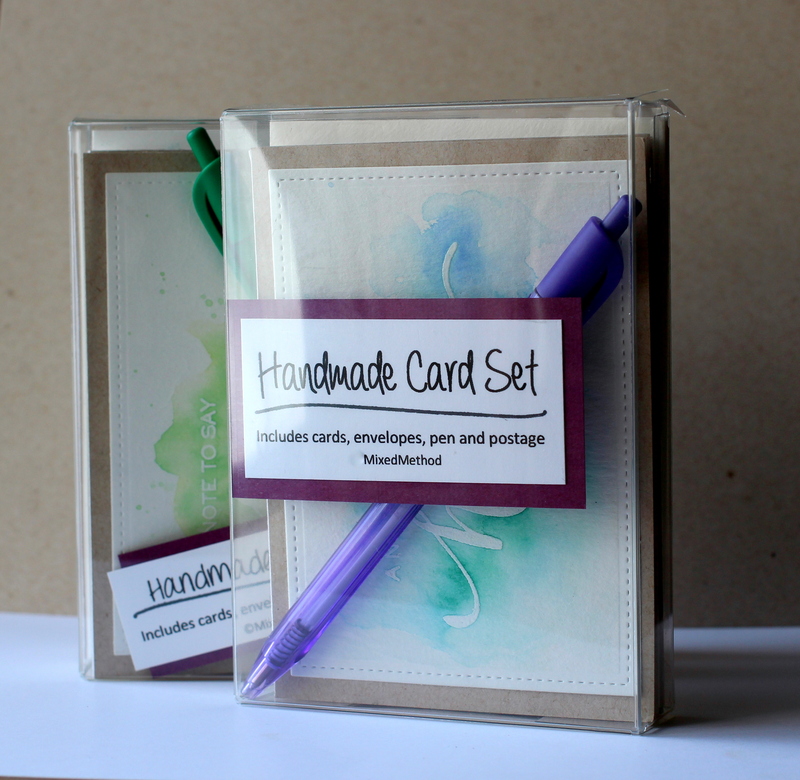 Handmade sets of anything always make a really nice gift. In all my cardmarking, I decided that sets of cards would be a really easy and thoughtful gift to send off to some of my friends who live far away. 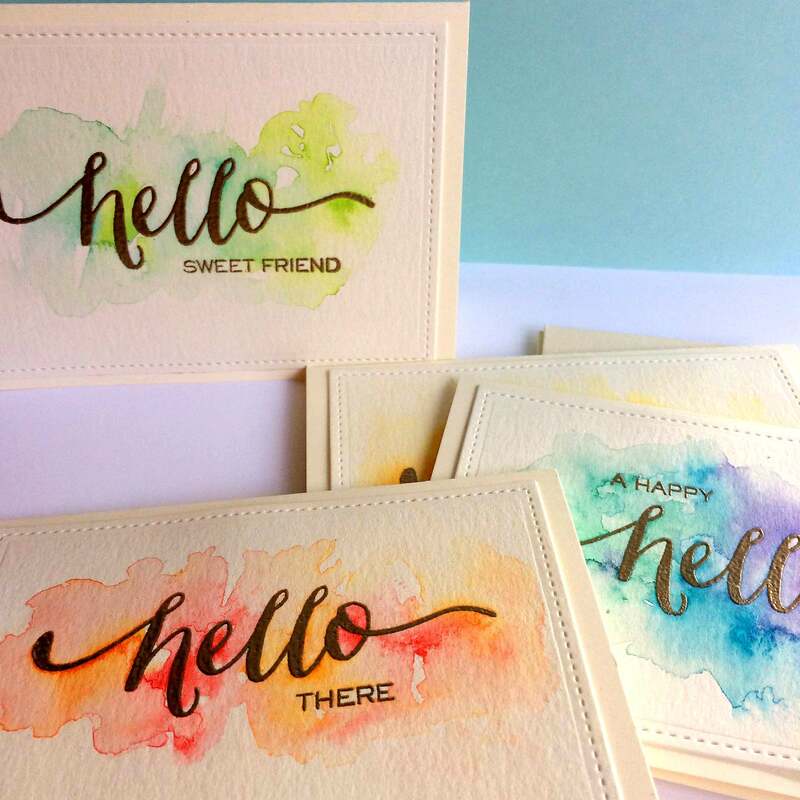 I decided on an easily reproduce-able design and used a very simple technique of embossing a sentiment on watercolor paper, and doing a watercolor wash in various colors for the different cards. I then mounted the watercolor panel onto a 4bar-size card base. For some of the cards, I embossed the Hello sentiments with platinum embossing powder, for others I used white or clear embossing powder. Some cards I mounted on off-white cards, others I mounted on kraft cardstock cards. I like to mix it up. 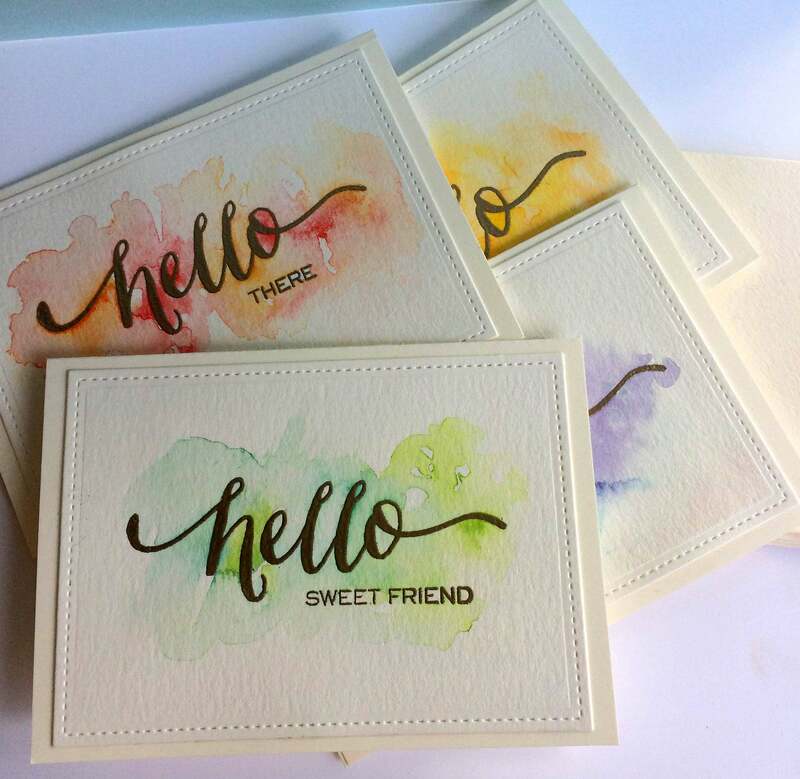 I also used a variety of smaller sentiments to go with the “hello” to give a variety of card choices to the recipients of the card sets. I included 4 cards in every card set, along with 4 envelopes, postage and a pen. I put everything in a nice clear box (that I ordered from clearbags.com), and made a little label for each set on my computer. I had so much fun making these and shipping them off. Adore! Especially love that you include a pen and postage! Thanks Lael! I have to say the idea of adding those things is not entirely mine. It’s an idea I got from an online card class (onlinecardclasses.com). Stunning cards! Could you advise on the dies you used to get the stitched look around the watercolour cardstock? Thank you, Suzie! Good question. I used the large stitched rectangle die from Lawn Fawn for the card panels – the second largest rectangle in the set, which is 4.5″ x 3.25″. These are so pretty. Can I please ask, did you emboss first, and then do the watercolor, or watercolor first. Some of the loops fit the watercolor spray perfectly. I just love these cards. I embossed everything first, though you could do it after if you wanted. Watercolor paper does sometimes have a tendency to warp after it dries, so I think you’ll get a better overall result if you emboss first. I love this. I want to use this idea for my volunteer work at a local hospital. Do you have any advice ( or tutorials) for creating the watercolor background? Mine come out messy. Thanks! Hi Lindy. I’m glad you like the project! My best advice for watercoloring is to just have fun with it and try to let the water do the work for you! If you dampen the paper a bit first, then you can add some color and let the water move the pigment around for you. There are a lot of great videos for card makers on youtube, so you may want to check some of those out, too. Dawn from Wplus9 is a pro at watercoloring, I’d recommend any of her videos! I am new to this, what type of paper do you use? They are lovely! Thanks Vicki! I use a good quality heavy card stock. For white cards 80lb Neenah Solar White is my favorite. These are beautiful! I would love to make something like this for Christmas gifts. Did you purchase the folded cards or make them yourself? And did you cut our the card stock or purchase it this size? Would you mind sharing were you bought this stuff? Thank you! You are very talented! Hi Casey! Thank you for your comment! I used 8.5″x11″ card stock to make the card bases, I cut it to size and folded it myself. I generally purchase 80lb Neenah Solar White cardstock which I order from simonsaysstamp.com. 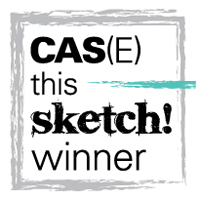 I believe I used canson watercolor paper for the watercolor panels, which I also just cut down to size, a bit smaller than 4.25″x5.5″ I usually get my watercolor paper at my local art supply store. I hope that helps! Thank you for sharing this great card set idea! Thanks, Jo Ann! I’m glad you like it!